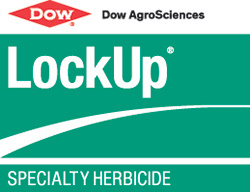 LockUp® specialty herbicide provides powerful postemergence broadleaf weed control in a convenient granular formulation. Labeled for use on cool- and warm-season grasses, LockUp offers excellent control of broadleaf weeds, including white clover, dollarweed and dandelion. It is effective at extremely low use rates (0.02 to 0.06 lb. a.i./A) and demonstrates better efficacy compared with other granular herbicide options. LockUp is available from distributors nationwide on granular fertilizers in single, two-way and three-way combinations to provide the broadest spectrum of weed control. For more information, visit the product page for LockUp. ®Trademark of The Dow Chemical Company (“Dow”) or an affiliated company of Dow. State restrictions on the sale and use of LockUp apply. Consult the labels of products containing LockUp before purchase or use for full details. Always read and follow label directions.